1. 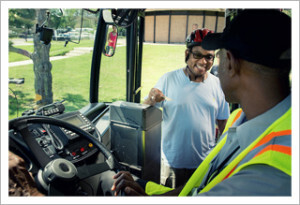 Inform the bus driver that you are going to load your bicycle and then proceed to the foldable rack on the front of the bus. Instructions for loading your bicycle will also be posted there. 2. Grasp the handle at the top of the rack, squeeze and pull it down. 3. Lift the bicycle onto the rack, placing it into one of the slots. 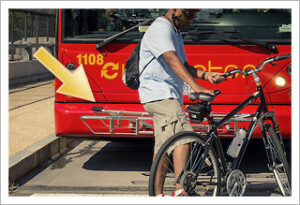 There is a spring-loaded support arm attached to each bike space. Place the front wheel of the bicycle pointing toward the support arm and pull the bar up and over the front tire. 4. 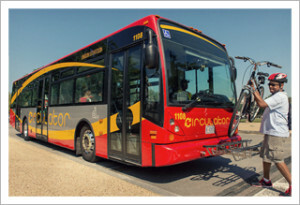 As you ride comfortably on the bus to your next stop, do not forget that your bike is hanging out on the front of the bus, comfortably enjoying the ride as well. 5. 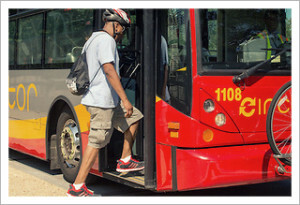 As you exit, again let the driver know that you will be removing your bicycle from the rack. 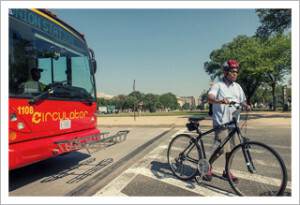 Lower the support arm and raise the bicycle rack back up to the front of the bus.